Mouth (oral) problems are more likely to occur in people with low CD4 counts. They can be caused by either fungal, viral or bacterial infections. You are more likely to get oral infections if you smoke. Looking after your mouth is very important. Many HIV-related conditions can affect the mouth, causing symptoms such as ulcers, dry mouth and painful lesions. Mouth problems can be caused by fungal infections, viral infections or bacterial infections. Some medications can also cause problems in the mouth, as can poor nutrition. Problems are more likely to occur in people with low CD4 counts. They may be an early sign of damage to the immune system. HIV treatment and other medications can treat mouth infections. Regular medical/dental check-ups may prevent serious mouth conditions. Looking after your mouth (dental hygiene) is important in order to keep your mouth healthy and to notice any problems early. Regular brushing and flossing help ensure good oral and dental health. Smokers are more likely to get oral infections than non-smokers. If your immune system is healthy, you are less likely to experience HIV-related mouth problems. If you are not taking HIV treatment and you start having health issues such as mouth ulcers or oral candidiasis (thrush), it may be a sign that HIV is damaging your immune system and your CD4 count is dropping. HIV treatment is recommended for everyone living with HIV, as it helps to prevent damage to the immune system. 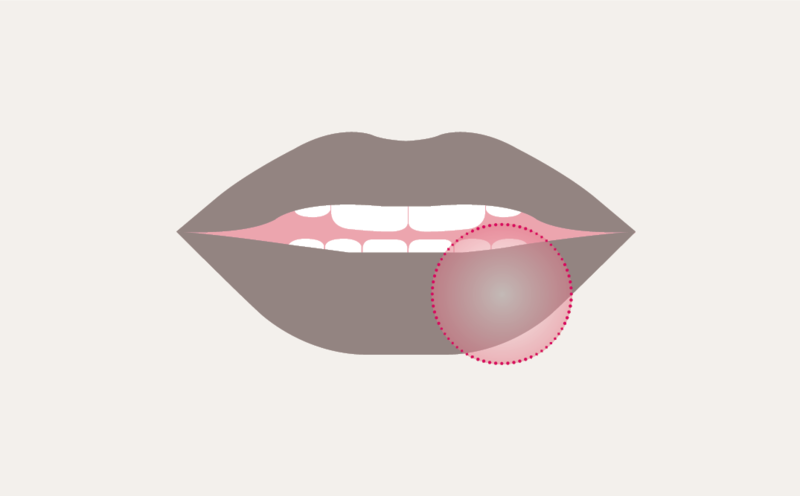 There are some mouth problems that are more common in people with HIV. These are described below. Some are more common or may become more serious in people who have a low CD4 count. Talk to your healthcare team about any concerns as soon as possible. They are often easily treated, and can improve the quality of your life. It also means that, if mouth problems are a symptom of something more serious, it will be picked up early. some other sexually transmitted infections, including chlamydia, gonorrhoea and syphilis. Small ulcers may heal after the use of mouthwashes, local anaesthetic, or steroid gels. For persistent ulcers, thalidomide may be effective; it is prescribed in the UK on a named-patient basis. Dry mouth can be caused by being dehydrated (from not drinking enough fluids), being nervous or anxious, or having a blocked nose. Diabetes can cause a dry mouth. It can also be a side-effect of certain medications, including some types of antidepressants, insulin and nasal decongestants. A dry mouth may be due to HIV-associated salivary disease, which causes swollen salivary glands. This condition is particularly common in children living with HIV. HIV treatment can prevent this happening or treat it. "Looking after your teeth and gums is important for everyone." If you have a dry mouth, you may have bad breath, problems with chewing and digestion, or develop high levels of mouth acid. This increases the risk of thrush, bacterial infections and tooth decay. Simple treatments include increasing the amount of liquid you drink, sucking sugar-free sweets or chewing sugarless gum, and sucking on ice cubes. Avoid alcohol, caffeine and salty foods. Giving up smoking may help with a dry mouth. There are artificial saliva substitutes. Your GP (family doctor), HIV doctor or a dentist can prescribe these. Oral candidiasis or thrush causes white blobs in the mouth and throat. You may get red patches and inflamed cracks in the mouth. Thrush is due to the overgrowth of naturally occurring fungus. Overgrowth may occur when the immune system is damaged (e.g. CD4 count below 400). Thrush may also be related to the use of antibiotics or as a result of conditions such as diabetes. There is more information in our factsheet about candidiasis (thrush). There is some evidence that people with HIV may be more likely to develop cancers of the mouth and throat. These cancers are linked to infection with certain strains of human papillomavirus (HPV). Some research has suggested that having hepatitis C (HCV infection) may also increase the risk of some head and neck cancers. It is a good idea to mention any unusual mouth symptoms to your doctor or dentist. OHL causes white patches with small, hair-like protrusions which usually occur on the side of the tongue. The patches look like thrush, but they can't easily be removed. OHL is usually caused by the Epstein-Barr virus and may be a sign that your immune system is becoming weakened. Being on HIV treatment will strengthen your immune system and the leukoplakia should improve. Therapy for herpes, warts and thrush may sometimes be effective against OHL. Your gums should be pink and firm, and not bleed when you brush your teeth. Symptoms of gum disease are inflamed and painful gums, and bleeding after brushing or flossing. Gingivitis is caused by bacteria in dental plaque. Gum disease can also be a symptom of diabetes and poor nutrition, and becomes more common in older age. It can be a sign of damage to your immune system. HIV treatment can reverse this damage. Regular brushing and flossing help prevent infection. Antibiotics and mouthwashes can also treat the infection. Cold sores are small, painful lesions on the lips or mouth, caused by the herpes virus HSV-1. They usually heal by themselves over several weeks. You can also buy antiviral creams over the counter, which can reduce symptoms and speed up healing. If you have more serious outbreaks of herpes, you may be prescribed antiviral drugs such as oral aciclovir and valaciclovir to treat and/or prevent outbreaks of herpes. Looking after your teeth and gums is important for everyone. This includes brushing your teeth at least twice a day, and flossing or using interdental brushes. Eat a healthy diet, limiting the amount of sugar and alcohol you have. Don’t smoke and have regular dental check-ups. Mention any unusual symptoms to your doctor or dentist.